You’re like a chip off the old block if you appreciate today’s food holiday. August 4 is National Chocolate Chip Day! At least, I think it is. Don’t you just love discrepancy? I originally had today listed as National Lasagna Day, and while a few websites concur, most showed that on July 29, so we celebrated it then. Which left the “real” food holiday for August 4…umm, a bit of a mystery. Occasionally, we’ll come across a day where consensus is lacking, or there just isn’t a lot of information. Today is like that. But several sources list it as National Chocolate Chip Day, which is good enough for me! (Further confusing matters: May 15 is/was either National Chocolate Chip Cookie Day or National Chocolate Chip Day, depending on whom you believe). Sheesh. Can you pass the Excedrin? I discussed how chocolate chips were invented in my previous post in May, so we won’t rehash that. The fact is, I’m loathe to rehash anything we have to celebrate twice, but when it comes to chocolate chips, it’s hard to think of making anything else with them but cookies. Still, a quick online search netted some rather unusual chocolate chip recipes. The non-adventurous need not apply. 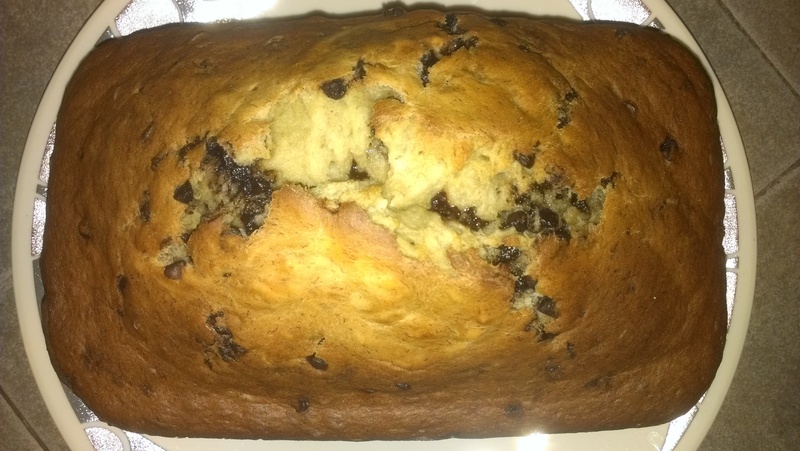 We were fresh out of crickets, so to celebrate, we decided to make banana bread with chocolate chips. 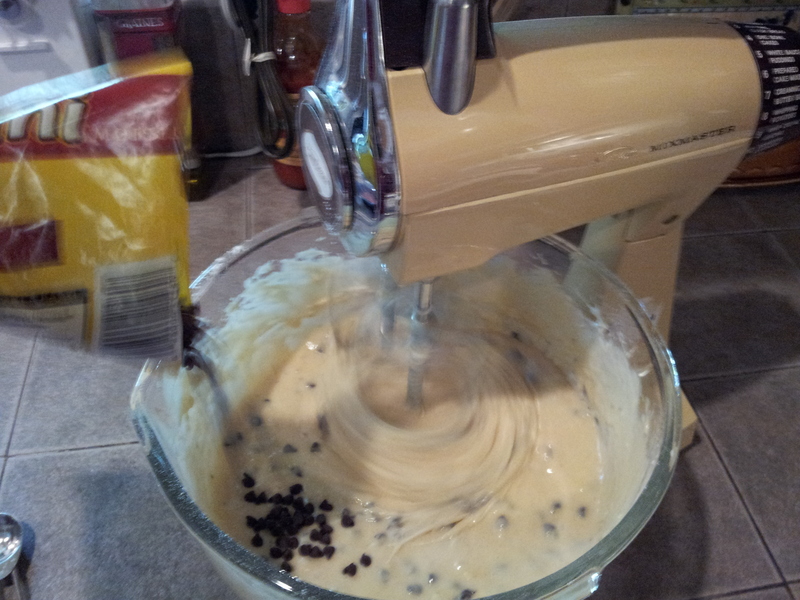 Since Tara did all the work, I’ll let her talk about the recipe…and also her super cool new mixer! Hi there! My recipe is there on the left. As you can tell from all the splatters, this page sees a lot of use. 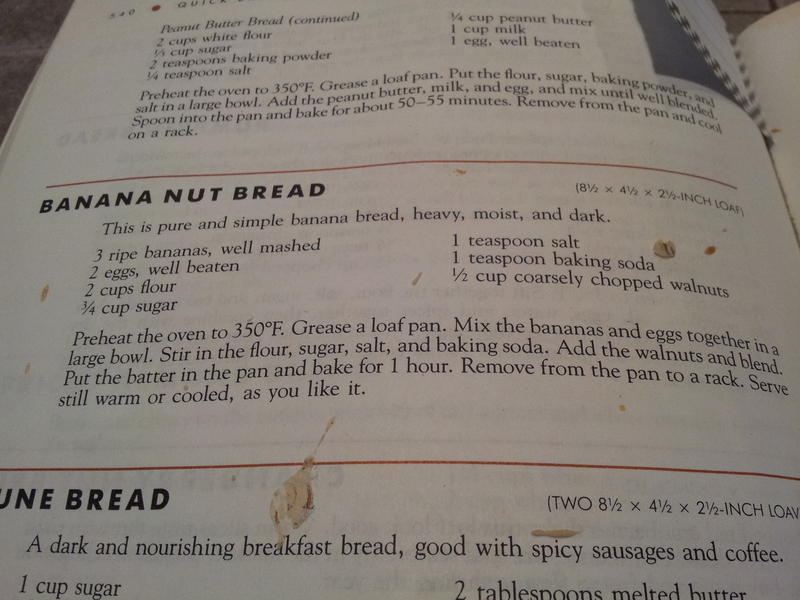 The recipe is from a Fanny Farmer cookbook that was given to me on my 18th birthday. The cover is long gone, one corner is chewed up from one of my dogs, there are lots of scrap pieces of paper used for bookmarks, along with quite a few bent corners. My super cool mixer was purchased yesterday at the local Value Village thrift store. We had a few items to donate and decided to take a quick look inside. I stopped dead in my tracks when I saw it and wide-eyedly asked Mark if I should get it. A little bit of hopeful expectation in my tone of voice. He said absolutely and suggested I plug it in to make sure it worked. It did…and does wonderfully. It’s a Sunbeam Deluxe Mixmaster Mixer, circa 1975, and a steal at $24.99. I have a feeling this is going to be a staple in our cooking from now on. Is today’s food holiday sweet? You’d butter believe it! July 9 is National Sugar Cookie Day. While chocolate chip cookies may be more popular, sugar cookies have a long and rich history dating back hundreds of years. Cookies themselves are believed to have originated from small batter cakes that Persian bakers used to test the temperature of their ovens around the 7th century before committing to baking an entire cake. Rather than throw these often hardened scraps away, they were sold as miniature cakes, and quickly caught on in popularity. Because texting hadn’t been invented yet, it would take nearly 1000 years for word of these treats to spread to Europe. “Sugar cookies” is a boring name considering some of the early monikers for this cookie, which included jumbles, crybabies, plunkets, gemmels, gimblettes, and cimbellines. 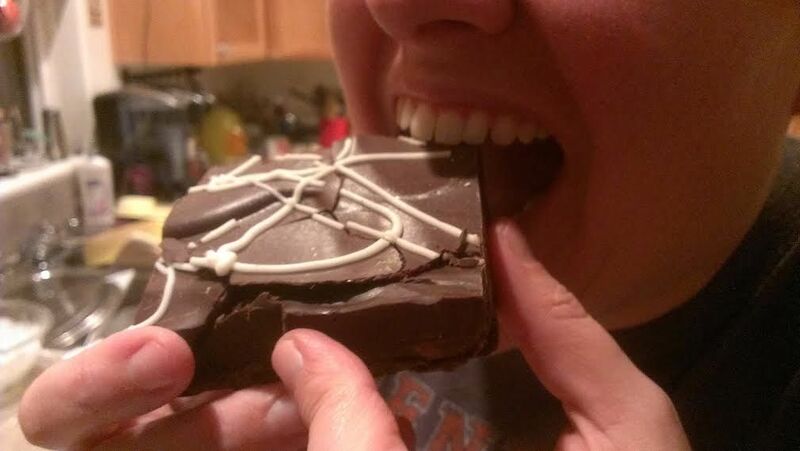 The name may have varied, but the main ingredient remained the same: chocolate. Kidding. The main ingredient in a sugar cookie is sugar. 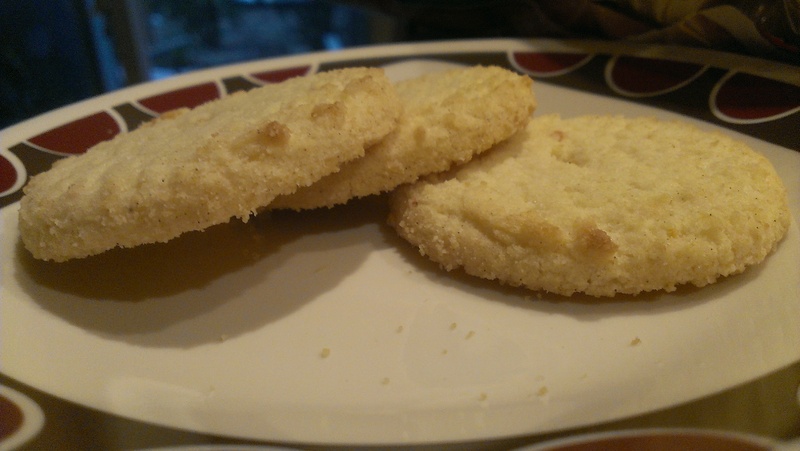 Depending on how fine the granules are, sugar cookies can be either thin and crispy, or plump and chewy. 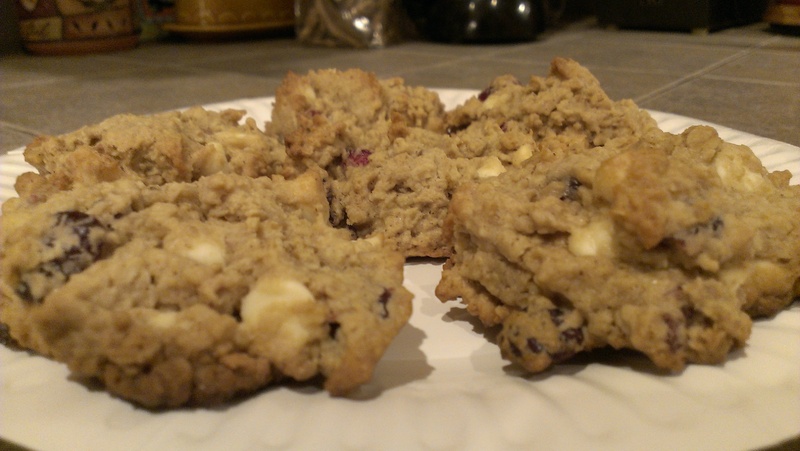 They are one of the simplest cookies to make and, despite a lack of fancy ingredients, one of the tastiest…at least in my opinion. 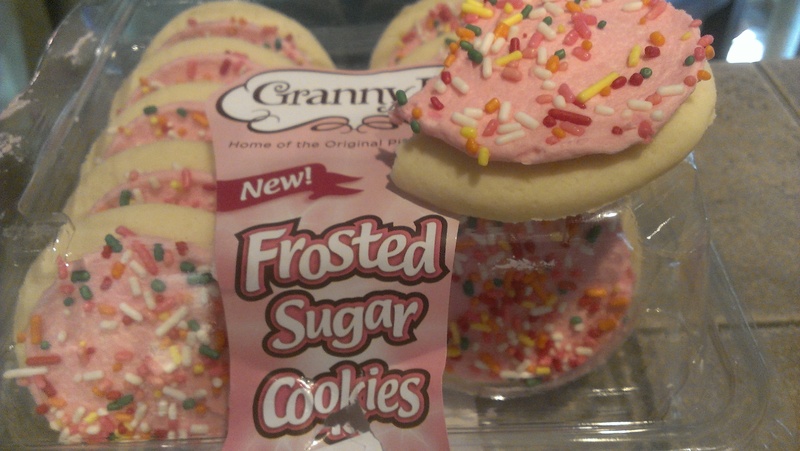 We picked up some sugar cookies with frosting. That’s right. We like to kick things up a notch whenever possible! You might find yourself in a sticky situation if you celebrate today’s food holiday…but you’ll love it! June 12 is National Peanut Butter Cookie Day. George Washington Carver may have had a confusingly Presidential name, but the agricultural teacher at Alabama’s Tuskegee Institute was more interested in peanuts than politics. He advocated them as a replacement crop for cotton, which was being decimated by insects at the time. Carver published a cookbook in 1916 called How to Grow the Peanut and 105 Ways of Preparing it for Human Consumption, which might just win the award for Longest Cookbook Title Ever. The book contained three recipes for peanut cookies, all of which called for crushed or chopped peanuts. It wasn’t until a few years later that peanut butter was listed as an ingredient. 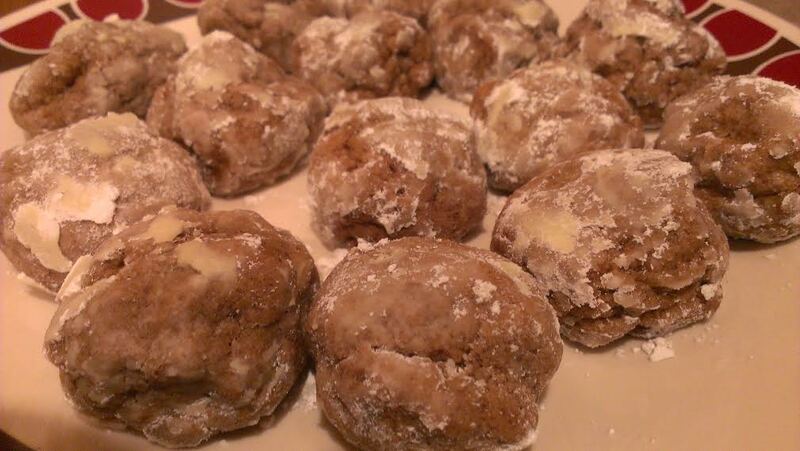 Originally, the cookies were formed into balls, but these did not cook properly. 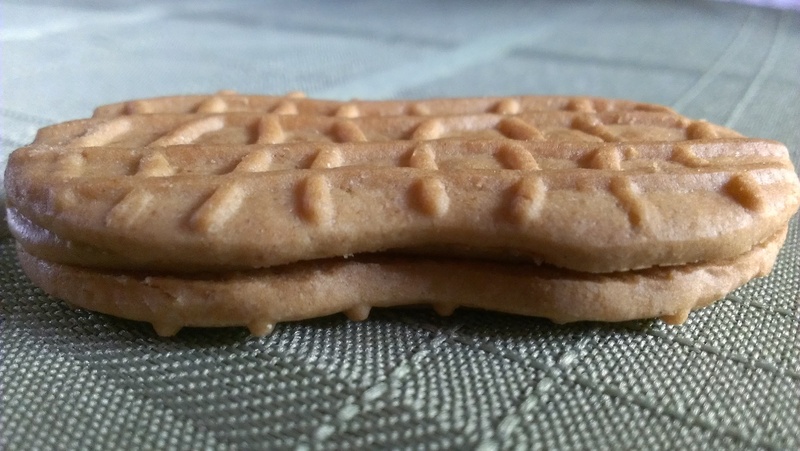 Bakers began flattening the dough with forks, leading to the signature criss-cross marks so closely associated with peanut butter cookies. Pillsbury touted the use of a fork to make these waffle-like marks, when their recipe for Peanut Butter Balls was published in 1933. Cooks were instructed to press the cookies using fork tines. Alternative methods called for using a device called a cookie shovel, and then transporting them to the oven using a cookie wheelbarrow. Crumbs could be cleaned up using a cookie rake. Our peanut butter cookies still contained crosshatch marks even though we didn’t make them from scratch. Instead, we opted for some Nutter Butters, which have the added advantage of being peanut butter cookies shaped like peanuts. Mr. Carver would be impressed. Today’s food of honor may not have universally agreed upon ingredients, but the general consensus is that it’s delicious no matter how it’s made. May 31 is National Macaroon Day! What a fun word to say, by the way. Macaroon. Macaroon. You’d have to be a real buffoon if you didn’t like saying the word macaroon. A macaroon is a light baked confection, either a small cake or soft cookie. In America, macaroons are traditionally made with coconut, but in many countries they are prepared with almonds. Occasionally, other nuts such as pecans, cashews, or hazelnuts are used. Indeed, the first macaroons were created by monks in an Italian monastery during the 9th century, and were essentially almond meringue cookies. The word comes from maccarone, Italian for “paste” – yummy! – and, yes, it’s the same word used to describe macaroni. Macaroons were introduced to France in 1533 by the pastry chefs for Catherine de Medici, the wife of King Henri II. During the French Revolution, a pair of Benedictine nuns, Sisters Marguerite and Marie-Elisabeth, who were seeking asylum in the town of Nancy paid for their lodging by baking and selling macaroons. They subsequently became known as the “Macaroon Sisters.” As the cookie spread through Europe, people began adding coconut, and in many recipes it completely replaced almonds. Surprisingly, Tara had never had a macaroon before. I happen to love them, but then again, I’m a big fan of coconut. The cookies were delicious!